To arms! To Arms! Cartoonists beware! We’ve all heard the stories and rumors about radical religious groups and even government targeting political cartoonists, attempting to silence their creativity and voice. It seems India, for the first time, are publicly prosecuting Google, Yahoo and Facebook in court over refusing to remove insulting material. In other words, Indian leaders are offended by cartoons and images, and want GOOGLE to remove the general public’s ability to find them. Google is a search engine company, and doesn’t really create content, nor is it responsible for the content on the web. But Indian officials are making them responsible for what they deem inappropriate. ZOINKS! The Indian Government thinks they should not have to be subjected to search engine results that are U.S.-oriented, and are not sensitive to Indian sensibilities. No matter how you slice it, it’s CENSORSHIP. I suppose India has every right to censor whatever they want to, but to make an American company responsible for the content of trillions of web pages in thousands of cities in a hundred countries is beyond reasonable. Why can’t they just keep doing what they already do and block Ips? For a country heavily dependent on technology ( more specifically the Web), they may be shooting themselves in the foot. I am fully prepared to have my IP blocked in India as a result of this post. I’m not making this up. Read what MSNBC has to say about it here. 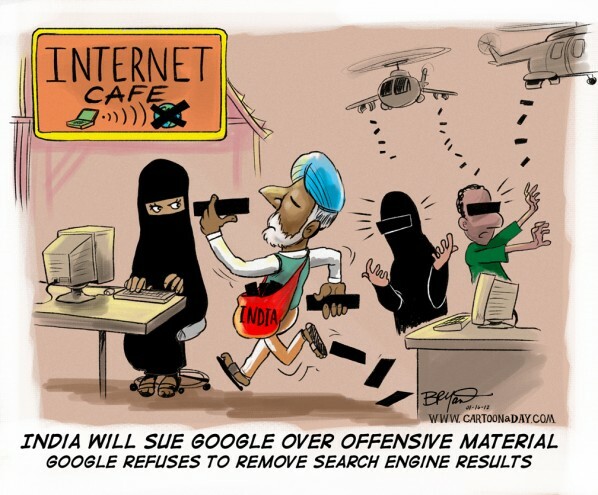 Daily cartoon featuring India, who plans to sue Google over offensive material. Indian government requires censorship.